You wake up, roll out of bed, and make your way into the bathroom, only to discover that somehow your face has grown an unsightly, white-tipped pimple. But beyond the negative impact that pimples can have on the way you look, they can be downright uncomfortable as well. Swollen, puffy, and sore, these miserable little pustules can come out of nowhere and completely ruin your day. And even though real beauty has almost nothing to do with appearance (despite what movies, television, fashion magazines, and advertisements may claim), having a massive zit (or zits) taking up all of the best real estate on your face has a way of negatively impacting a person’s self-esteem. Although pimples may seem as though they just magically and horrifically appear out of thin air, the reality is that pimples follow a very specific lifecycle. You see, across the entire surface of your body, you have tiny openings in your skin called ‘pores.’ There are two kinds of pores, and they serve different (but similar) functions. Sweat gland pores produce perspiration across the surface of the body to help regulate internal temperatures, while sebaceous gland pores produce a different mixture of liquid fats and proteins called sebum, which coats the skin in a protective layer known as hydrolipidic film that helps waterproof and protect it from bacteria. Sebaceous glands also house hair follicles, which help guide the sebum oil to the surface. Unfortunately, sebum doesn’t always make it all of the way out. 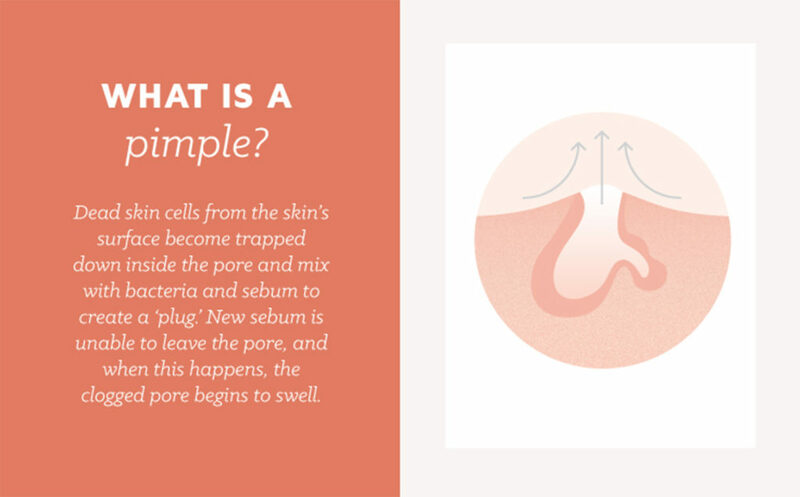 Sometimes, dead skin cells from the skin’s surface become trapped down inside the pore and mix with bacteria and sebum to create a ‘plug.’ New sebum is unable to leave the pore, and when this happens, the clogged pore begins to swell. Clogged pores can produce several different kinds of pimples and skin irritations, but we’re going to focus on pimples—whiteheads and blackheads. Whiteheads are clogged pores that have almost completely closed. The trapped plug then pushes against the closed opening, filling with pus, and creating the light-colored tip that gives whiteheads their names. Blackheads are clogged pores whose openings remain open to the outside air. The plug oxidizes, hardens, and turns dark in color. Blackhead pimples don’t generally become as swollen as whiteheads do. Pimples carry with them a certain stigma of uncleanliness, but the fact is that most acne outbreaks are a product of hormonal changes within the body, rather than as a result of poor hygiene. And while the hormonal changes that play a large part in pimple formation are most prevalent in teenages, acne among adults is also common. So, when faced with the appearance of a new and terrible pimple on the one part of your body most likely to be seen by everyone you meet, what do you do? Of course you pop it. There are a number of potential problems that come from popping pimples. For one thing, it’s usually not a very sanitary process, and can introduce new bacteria to already damaged tissue, possibly leading to infection. For another thing, any ejected pus, sebum, bacteria, or grime can easily find its way down into other pores, leading to further breakouts. At the same time, the act of popping is very destructive, and can damage sensitive tissue in ways that the pimple itself would not have, and if done incorrectly, the sebum plug may be only partially removed, or worse, forced further down into the pore where it can cause even worse damage. Likewise, popped pimples have a tendency to leave scars behind after healing. The real kicker is that once a pimple has been popped, the pore itself remains irritated and swollen, and due to the additional damage that comes as a result of being forcefully popped, it will likely remain so for even longer than it would have if you had left the pimple alone. 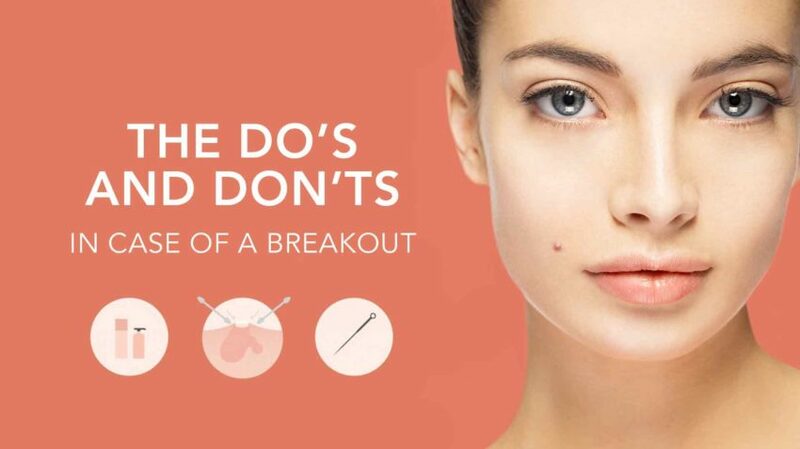 The point we’re trying to make is this: Don’t pop your pimples. If you have a single pimple every now and then, leave it be and let it run its course (most pimples will fade and disappear within 3–7 days). If you suffer from constant, uncomfortable acne, then reexamine your cleansing process and see a dermatologist who can help you create a targeted, personalized plan. Pick the right pimples. Not all pimples are created equal. Pimples that are far below the surface should never be popped, because you’ll likely do a lot of damage to the tissue between the plug and the surface. Wait until a pimple has a firm, white head before you attempt a pop. Wash your hands and face. One of the biggest threats that comes from popping pimples is the potential of introducing bacteria to the site. Before you tackle any of your poppable zits, gently (but thoroughly) wash your entire face and hands with antibacterial soap. Certain scrubbing devices that use soft silicone brushes can help clear away any residual bacteria or grime, leaving your face clean and ready for the next step. Use warm water when washing your hands, and be sure to clean underneath your fingernails. You may also wish to wear latex gloves, for added protection. Sterilize a needle. Although it may be tempting to pop the pimple by squeezing it, it is much safer to lance it with a needle, provided that the pimple is close to the surface. Locate a thin needle, and then sterilize it. Do this by carefully washing the needle with soap and water (to remove any small bits of dirt that might have accumulate on it), and then filling a small cup with rubbing alcohol or bleach. Dip the needle into the solution, and then gently allow any excess chemical to drip off of it, being careful not to get any on your clothing or skin. Lance the pimple. Position the needle parallel to the surface of your skin, with the point directed at the tip of the whitehead. Gently pierce the tip of the center of the pimple, being careful not to push it through the opposite side of the pimple. This shouldn’t cause any pain, as the skin covering the tip of the pimple should already be dead. If you do experience any pain, this means that the pimple is not yet close enough to the surface to be popped. discontinue your attempt and allow the pimple to go away on its own. Remove the needle. Slowly pull the needle out from the pimple. In many cases, the pressure from the swollen pimple will automatically begin to push out the pus. Have a small bit of tissue on hand to catch any ejected pus before it can touch the surface of your skin. Finish it off. Using two clean cotton swabs, apply a small amount of pressure to either side of the white tip of the zit. Move the cotton swabs a few times so that you are not applying too much pressure to one single area. The remaining pus should be pushed out from the pimple. Continue with this process until only a clear fluid is being released from the pimple. If the pus doesn’t come out easily, discontinue your attempt. Clean up. After you’ve popped the pimple, wash your face and hands a second time with antibacterial soap, and then apply a small amount of alcohol to the remains of the blemish—this will help keep bacteria from repopulating it. We really can’t stress this enough: Quickly popping a pimple without taking the proper precautions can easily lead to scarring, breakouts, and infection. If you absolutely must pop a pimple quickly, cover your fingers with tissue paper, and be careful not to put too much pressure on the area around the pimple for any prolonged period of time. Instead, move your fingers to different spots as you squeeze to minimize damage. That having been said, squeezing a pimple in order to pop it will damage your skin, so we don’t recommend it under any circumstances. Clean everything thoroughly. We partially covered this in the last section, but allow us to reiterate that cleanup is a vital part of the popping process. Not only should you thoroughly clean the area directly around the popped pimple with antibacterial soap, but you should clean the rest of your face as well. Also wash your hands, to remove any bacteria or pus that may have gotten on them. Don’t forget to wash the needle as well, even if you plan on disposing of it. Apply some acne product to the pimple. You may find that some pimples have a tendency to come back after being popped. You can decrease the chances of this happening by applying some acne product directly to the popped pimple. Be sure that the product contains salicylic acid as the active ingredient, as this can be used to break apart any remaining sebum that might still be down in the pore. Reduce the swelling. Even if the sebum core has been extracted, many pimples remain painfully swollen. You can help relieve this swelling by wrapping an ice cube in a paper towel, and applying the makeshift ice pack directly to the swollen area. Additionally, the gel inside of an ibuprofen gel capsule, or a paste made from crushed aspirin and water, can be applied to the site for similar results. Preventing scars. If you’ve followed the proper procedure for popping pimples, you shouldn’t have to worry about developing bad scars. However, you can further decrease the likelihood of scarring by applying a small dab of honey, lemon juice, or aloe vera gel to the pimple. Click here for more information on how to deal with acne scars. As has been stated above, the biggest cause of pimples isn’t hygienic; it’s hormonal. That having been said, there are still a number of steps that you can take to minimize your chances of suffering from an outbreak. Wash regularly, and wash right. Sebum, dead skin cells, and bacteria are the three main ingredients necessary for producing a pimple. And while your production of sebum may be completely out of your hands, regular washing of your face and hands can really cut down on the amount of dead skin cells and bacteria that find their way into your pores. When washing, be sure that you follow the proper skin cleansing routine. Gentle exfoliation, such as with the LUNA 2 facial cleansing and anti-aging device, can also help break up and remove possible buildup before it can take root. Change your diet. Evidence suggests that diets low in sugar, alcohol, dairy (except greek yogurt), and processed foods, but that are rich in leafy greens, antioxidants, zinc, and polyphenols can help reduce the severity and duration of acne. And, as important as it is to regulate the food that we take into our bodies, certain foods can be just as detrimental to skin health just by touching our bodies. Specifically, greasy or fatty foods that get on the skin of our faces while we eat can contribute to pore clogging. Use moisturizer. Although a lot of approaches to treating acne rely on drying out the skin, you should be careful not to neglect moisturizing. Overly dry skin is likely to become inflamed, and can lead to more intense acne breakouts. 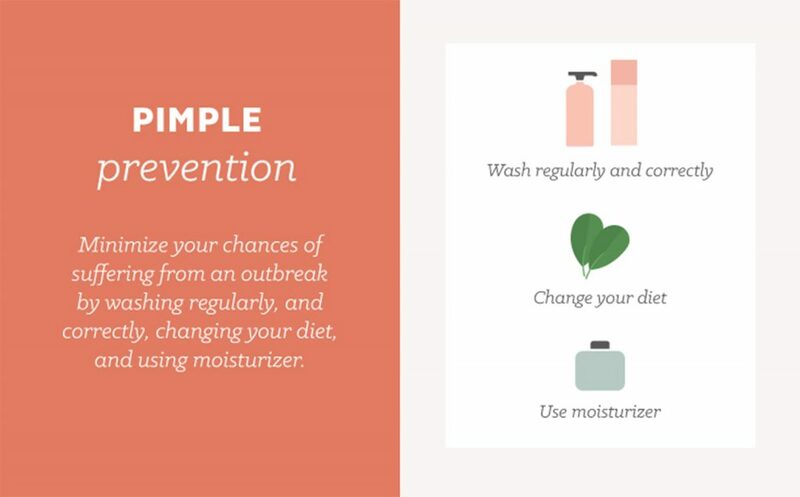 Gentle, oil-free moisturizers can help keep your skin healthy, and may prevent pimples. However, be aware that everyone’s skin is different, and while some may benefit from moisturizing, others might not; controlling oily skin is an issue that often requires unique solutions. Although your first instinct when discovering a new whitehead may be to pinch it into oblivion, take a step back and really consider the situation. There are a number of other ways to deal with unsightly pimples that are much less dangerous to the overall health of your skin. For emergency breakouts that threaten to lower your confidence, there is the ESPADA. Using professional-strength blue LED light, ESPADA targets and destroys acne-causing bacteria – no popping required. T-Sonic pulsations boost the effects of the blue light and help facilitate healing, for a pimple-clearing experience that’s just as gratifying as popping. Plus, its medical-grade silicone coating is antibacterial, so you never have to worry about spreading bacteria from spot to spot. With visible results after just one 30-second treatment, this handy little device will end your pimple-popping days for good. For more helpful tips and tricks, sign up for the MYSA newsletter now! Before reading this blog, I used to believe that popping a pimple is a bigger crime; I mean majority of the authoritative sites aren’t recommending popping pimples at home. But you, you have explained everything about it; how to pop with ultra care, and especially which pimples to pop.